An entire city for your 'punks to make their home in. Publisher's blurb: "NIGHT CITY. 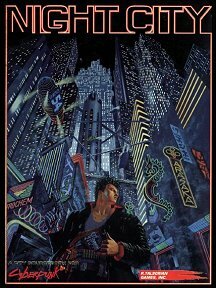 A monster sourcebook containing over 180 jam-packed pages of information on the definitive CYBERPUNK setting! Hit the CONTROLLED URBAN ZONES with 3D maps and detailed, building by building descriptions to match. Each section also includes comprehensive overviews of FLOOR PLANS, PERSONALITIES, ENCOUNTERS and CONTACTS. The FLASHMAPS Section puts you 'on the spot' at the hottest restaurants, clubs, and theatres, as well as SCHEDULES, TRANSIT MAPS and AREA VIEWS. the ARTICLES Section interfaces you with background on SECURITY, PEOPLE OF THE CITY, GANGS & TURFMAPS, plus a U.S. 2020 overview! "So, if you're looking for the ultimate dark future urban environment, take a trip to NIGHT CITY. because you may not live to get another chance."